Definition at line 113 of file stdlib.h. Definition at line 114 of file stdlib.h. Definition at line 128 of file stdlib.h. Definition at line 228 of file stdlib.h. Definition at line 261 of file stdlib.h. Definition at line 318 of file stdlib.h. Definition at line 690 of file stdlib.h. Definition at line 272 of file stdlib.h. Definition at line 62 of file stdlib.h. Definition at line 1182 of file stdlib.h. Definition at line 644 of file stdlib.h. Definition at line 239 of file stdlib.h. Definition at line 1283 of file stdlib.h. Definition at line 925 of file stdlib.h. Definition at line 1062 of file stdlib.h. Definition at line 48 of file stdlib.h. Definition at line 143 of file stdlib.h. Definition at line 118 of file stdlib.h. Definition at line 117 of file stdlib.h. Definition at line 130 of file stdlib.h. Definition at line 120 of file stdlib.h. Definition at line 119 of file stdlib.h. Definition at line 116 of file stdlib.h. Definition at line 38 of file stdlib.h. Definition at line 122 of file stdlib.h. Definition at line 124 of file stdlib.h. Definition at line 123 of file stdlib.h. Definition at line 70 of file stdlib.h. Definition at line 125 of file stdlib.h. Definition at line 127 of file stdlib.h. Definition at line 828 of file stdlib.h. Definition at line 1261 of file stdlib.h. Definition at line 1360 of file stdlib.h. Definition at line 35 of file stdlib.h. Definition at line 34 of file stdlib.h. Definition at line 102 of file stdlib.h. Definition at line 26 of file stdlib.h. Definition at line 43 of file stdlib.h. Definition at line 99 of file stdlib.h. Definition at line 1358 of file stdlib.h. Definition at line 1359 of file stdlib.h. Definition at line 137 of file stdlib.h. Definition at line 40 of file stdlib.h. Definition at line 132 of file stdlib.h. Definition at line 438 of file environ.c. Definition at line 27 of file errno.c. Referenced by _cwait(), _get_doserrno(), _set_doserrno(), and msvcrt_init_fp(). Definition at line 475 of file getargs.c. Definition at line 483 of file getargs.c. Definition at line 491 of file getargs.c. Definition at line 384 of file environ.c. Definition at line 454 of file environ.c. Definition at line 392 of file environ.c. Definition at line 477 of file environ.c. Referenced by atol(), atoll(), CommandDumpSector(), IopStartRamdisk(), and main(). Definition at line 245 of file stdlib.h. Referenced by test_fcvt(), and test_xcvt(). Definition at line 151 of file errno.c. Referenced by lltow(), and TimeToMsString(). Referenced by CShellCommandDACL::Execute(), CShellCommandOwner::Execute(), CShellCommandSACL::Execute(), CShellCommandValue::Execute(), CShellCommandDir::Execute(), inet_ntoa(), CHttpClient::Report(), CHttpClient::SendFile(), TuiDrawMenuBox(), and TuiUpdateDateTime(). Referenced by FormatBytes(), InitNumOfFracSymbCB(), SaveUserLocale(), SetMaxDate(), SetNTPServer(), and SpiStoreSzInt(). Referenced by test__tzset(), test__wenviron(), and test_environment_manipulation(). Referenced by TConfig::keyfile_init(), and test_searchenv(). Referenced by START_TEST(), and test_splitpath(). Referenced by PerfDataGetText(), and ulltow(). Referenced by AddNewLayout(), BcdDeleteElement(), OnInitDialog(), PerformancePageRefreshThread(), PrintingThreadProc(), RegistrationProc(), and ScmWaitForServiceConnect(). Referenced by CreateExtendedPartitionPage(), CreateLogicalPartitionPage(), CreatePrimaryPartitionPage(), and wWinMain(). Referenced by CConfiguration::CConfiguration(), CFSExtractIcon_CreateInstance(), CClassNode::ConvertResourceDescriptorToString(), CopyIpAddrString(), CreateNTPServerList(), BtrfsVolPropSheet::DeviceDlgProc(), DllMain(), DoLoadItems(), DoParseFile(), EnumPwrSchemes(), GetActivePwrScheme(), GetGWListEntry(), GetIntValue(), GetIpAddressFromStringW(), GetLayoutName(), GetPwrDiskSpindownRange(), InitFilterListBox(), InitVideo(), InsSpacesFmt(), InstallParallelPort(), InstallSerialPort(), IntLoadFontSubstList(), JapaneseEra_Load(), LayoutList_Create(), LoadBootIni(), LoadBootSettings(), LoadCurrentLocale(), LoadIniFile(), ParseArguments(), ParseCommandLine(), ParseSettings(), ProcessUnattendSection(), PropSheetDlgProc(), QueryBootStoreOptions(), ReadKeysSettings(), RegLoadMUIStringW(), RemoveDeviceW(), RemovePort(), ResetStatsW(), ResizeDeviceW(), BtrfsBalance::SaveBalanceOpts(), SetNewLocale(), SIC_LoadOverlayIcon(), SpiLoadInt(), StoreIPSettings(), ViewTree_LoadTree(), WlxScreenSaverNotify(), and wmain(). Referenced by BtrfsBalance::SaveBalanceOpts(), and wtoll(). Referenced by ApplyParameterStringsToMessage(), BuildCodePageList(), InstalledCPProc(), and XCOPY_ParseCommandLine(). Definition at line 56 of file atonexit.c. Referenced by __do_global_ctors(), main(), and openlog(). Referenced by __GetLCIDFromName(), __GetLocaleInfoUsingACP(), __intGetACP(), __intGetOCP(), __rpc_uaddr2taddr_af(), _ecvt(), _Locale_codecvt_create(), _Locale_ctype_create(), _Locale_monetary_create(), _Locale_n_sign_posn(), _Locale_p_sign_posn(), _Locale_strcmp(), _Locale_strxfrm(), _tmain(), add_widl_version_define(), AddrStrToAddr(), BGStartCmd(), CC_CheckDigitsInEdit(), CmdLineParse(), Telnet::Connect(), CreateOutputFile(), DebugCmd(), demangle_datatype(), DissectArcPath(), DoSHIFTSTATE(), doWinMain(), DriveMapGetBiosDriveNumber(), DriveMapIsValidDriveString(), Ext2ParseRegistryVolumeParams(), formatopts_proc(), FTP_ParseNextFile(), FTP_ReceiveResponse(), FTPDecodeURL(), FTPQueryFeatures(), get_constant_element_by_name(), get_modified_type(), get_parameter_element_by_name(), get_shell_icon_size(), getline(), GetPortNumber(), GetProtoGetNextEnt(), GetResponse(), GetScreenColumns(), GetSectionName(), GetTimeOut(), gl_init(), handle_escape_cmd(), handle_switch(), HCR_RegGetIconA(), HelpCmd(), InfGetBinaryField(), InfGetIntField(), init(), init_leases_list(), interpret(), iso9660_file_length(), isoname_endsok(), lineGetCountryA(), lineGetTranslateCapsA(), TMapLoader::LoadGlobal(), main(), metricfromreg(), MSVCRT_I10_OUTPUT(), name_to_codepage(), CDFParser::NextToken(), NSP_GetServiceByNameHeapAllocW(), OpenCmd(), OptionMenuCustomBootReactOS(), XMLStorage::XPathElement::parse(), ParseCmdline(), ParseFile(), ParseHostLine(), pe_find_section(), ProcessFirewallPrefFile(), processRequest(), puint_t_UserMarshal(), put_resource_id(), read_version_entry(), TConfig::redir_init(), s_square_puint(), s_square_test_us(), s_sum_cpuints(), s_sum_puints(), section_get_dword(), ServiceNameToPortNumber(), TConfig::set_bool(), TConfig::set_value(), SetConnTimeout(), SetCtrlTimeout(), setdebug(), SetLogSize(), SetPassive(), setpeer(), SetRedialDelay(), SetSOBufsize(), setup_dinput_options(), setup_dsound_options(), SetXferTimeout(), spy_init(), START_TEST(), StrToBool(), StrToIntA(), telCommandLine(), test_asyncWAVE(), test_asyncWaveTypeMpegvideo(), test_atoi(), test_AutoOpenWAVE(), test_file_inherit_child(), test_file_inherit_child_no(), test_firstDay(), test_GetCalendarInfo(), test_openCloseWAVE(), test_pipes_child(), test_play(), test_wm_set_get_text(), TIFFFetchStripThing(), translate_files(), translate_line(), UnDosLine(), UnLslRLine(), UnMlsT(), us_t_UserMarshal(), UserGetLanguageToggle(), value_get_dword_field(), while(), wined3d_dll_init(), wined3d_parse_gl_version(), and WinLdrSetupEms(). Referenced by _tzset(), arg_get_long(), create_msft_typelib(), doDebugger(), ExecuteKill(), ExpInitializeExecutive(), FTP_ParseNextFile(), get_session_start(), init(), IopStartRamdisk(), KdDebuggerInitialize0(), KdInitSystem(), KdpGetDebugMode(), netname2user(), ParseFile(), Phase1InitializationDiscard(), PrintProcess(), processRequest(), restart(), START_TEST(), Storage_DestroyElement(), and test_installprops(). Definition at line 1461 of file stdlib.h. Referenced by for(), and test_gcvt(). Referenced by _getopt_initialize(), _Locale_aux_default(), _tempnam(), _tzset(), addFlagsFromEnvVar(), compat_getenv(), create_msft_typelib(), get_wine_loader_name(), GetHomeDir(), getline(), getopt_internal(), GetPwByName(), GetScreenColumns(), GetUsrName(), gl_destroy_context(), gl_error(), gl_init(), gl_set_home_dir(), HelpCmd(), TConfig::inifile_init(), init_debug(), initialize_context(), InitOurDirectory(), InitPrefs(), InitTermcap(), InitUserInfo(), instrum_getenv(), INTERNET_LoadProxySettings(), jinit_memory_mgr(), TConfig::keyfile_init(), load_licence(), main(), matchSpecialFolderPathToEnv(), ODBC_LoadDriverManager(), OpenTrace(), optionInit(), parse_arguments(), printercache_load_blob(), printercache_rename_blob(), printercache_save_blob(), printercache_unlink_blob(), QMyDialog::QMyDialog(), rd_open_file(), rd_pstcache_mkdir(), read_rcfile(), TConfig::redir_init(), ruserpass(), save_licence(), QMyDialog::SaveClicked(), searchfileinpath(), select_file_name(), setnetpath(), shell(), START_TEST(), system(), telCommandLine(), test__tzset(), test_environment_manipulation(), test_localtime(), test_mktime(), test_searchenv(), TIFFFetchStripThing(), wave_out_open(), WinHttpGetDefaultProxyConfiguration(), xkeymap_open(), and xmlInitMemory(). Referenced by Telnet::Connect(), TMapLoader::Display(), TMapLoader::Load(), TANSIParser::ParseEscapeANSI(), TConfig::print_value(), Telnet::SetLocalAddress(), and test__itoa_s(). Referenced by div(), CMathTest::import_checks(), and inter_maxtoabs(). Definition at line 1444 of file stdlib.h. Definition at line 1462 of file stdlib.h. Definition at line 1465 of file stdlib.h. 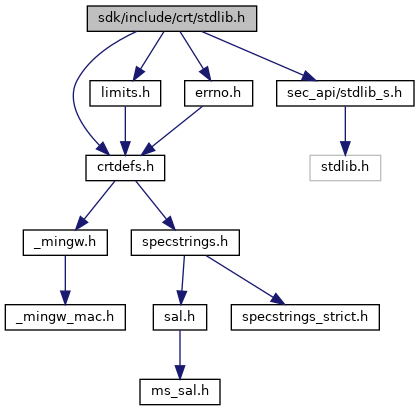 Referenced by streamout_wstring(), test_mbcp(), TRIO_ARGS3(), and TRIO_ARGS5(). Referenced by _Success_(), find_layer(), LoadLibraryList(), test__tcsncoll(), test__tcsnicoll(), test_mbstowcs(), TestHostName(), and ValidateShim(). Referenced by system_icmp(), test_localtime(), test_mktime(), test_searchenv(), and WinMain(). Definition at line 10 of file rand.c. Referenced by __random_number(), __xmlRandom(), Airbrush(), arc4random(), BindToEphemeralPortNumber(), cxxrand(), D3DRMVectorRandom(), DoStuff(), UnorderedTest::equal_range(), Fbt_CreateFiber(), Fbt_Yield(), generate_random(), GenerateComputerName(), GenerateRandomPassword(), get_uuid(), GetEnvVarOrSpecial(), CMathTest::import_checks(), InitGL(), main(), OnCreate(), RndShuffleTest::MyRandomGenerator::operator()(), PlaceMines(), randbytes(), random_number(), RandomGuid(), RemoveFile(), render(), RetrieveQuote(), ScreenSaverProc(), send_discover(), send_request(), SetObject(), CardStack::Shuffle(), state_panic(), test__hwrite(), test__lwrite(), test_CryptInstallOssGlobal(), test_qsort_s(), test_rand_s(), urlcache_entry_create(), and UuidCreateSequential(). Referenced by __xmlInitializeDict(), _tWinMain(), arc4random(), CardWindow::CardWindow(), UnorderedTest::equal_range(), Fbt_CreateFiber(), GenerateComputerName(), GenerateRandomPassword(), CMathTest::import_checks(), InitGL(), initrand(), main(), OnCreate(), PlaceMines(), PreInit(), RetrieveQuote(), test__hwrite(), test__lwrite(), test_qsort_s(), and write_btrfs(). Referenced by atof(), closestFit(), EvaluateExpression(), main(), test__strtod(), and while(). Referenced by CreateCaseDiff(), decode_html(), get_boot_addr(), get_boot_platid(), get_boot_size(), GetDlgItemInt(), handle_child_line(), Load_CP2Unicode_Table(), Load_OEM2Unicode_Table(), main(), Main_DirectDraw_GetDeviceIdentifier7(), make_number(), parse_parameters(), parse_server_and_port(), parse_value(), ParseField(), pev_get_val(), read_oid_info(), read_urls(), seamless_process_line(), SetupGetIntField(), SMTPTransport_ParseResponse(), stabs_pts_read_number(), stabs_read_type_enum(), START_TEST(), test_strtol(), TLB_GUIDFromString(), TRIO_ARGS3(), UrlUnescapeA(), while(), and xkeymap_read(). Referenced by _atoldbl(), and TRIO_ARGS2(). Definition at line 5 of file strtoull.c. 14 * See strtol for comments as to the logic used. Definition at line 1463 of file stdlib.h. Definition at line 1466 of file stdlib.h. Referenced by _wtof(), and number_from_string(). Referenced by CheckUnattendedSetup(), cmdConfig(), cmdHelpMsg(), ATL::CRegObject::do_process_key(), FindPortNum(), CFSFolder::GetCustomViewInfo(), GetIntField(), GetLongValue(), LanguagePage(), LoadKeyboardLayoutW(), LoadSetupData(), SelectDisk(), SelectPartition(), SetupStartPage(), wmain(), and WSPStringToAddress(). Referenced by _Success_(), CRT_Tests(), gz_open(), mbslen(), START_TEST(), test_mbstowcs(), UDFGetDeviceName(), wctombs(), WSAEnumProtocolsA(), and WTSQuerySessionInformationA(). Referenced by _LocalOpenPrinterHandle(), AddNewLayout(), ArcGetNextTokenU(), BiEnumerateElements(), cmdAccounts(), cmdUser(), CreateKeyboardLayoutList(), ATL::CRegObject::do_process_key(), do_reg_operation(), DoParse(), DosStart(), DWORDfromString(), FontProc(), FontSizeList_GetSelectedFontSize(), GeneralPropertyPageLocalesEnumProc(), get_regdata(), GetDeviceLocationString(), GetLPTTransmissionRetryTimeout(), GetProfiles(), GetTimeZoneListIndex(), GetULONG(), GetUsedPorts(), ImageFile_ParseCmdline(), InitializeDefaultUserLocale(), InitializeGlobalJobList(), IsLayoutExists(), LoadCurrentLocale(), LoadKeyboardLayoutW(), LocalesEnumProc(), MAIN_LoadSettings(), modify_dword_dlgproc(), NtPathToDiskPartComponents(), parse_data_type(), ParseCmdLine(), ParseCmdline(), ParseDaysOfMonth(), ParseId(), ParseSetupInf(), ParseTime(), ProcessCommandLine(), ProcessDisplayRegistry(), ReadSZFlagsFromRegistry(), SamrGetAliasMembership(), SetConsoleCodePage(), SortEnumProc(), SortTestEnumProc(), StrToColorref(), UnescapeHex(), UnescapeOther(), and wWinMain(). Definition at line 1464 of file stdlib.h. Definition at line 21 of file getargs.c. Referenced by __getmainargs(), __p___argc(), __wgetmainargs(), _tWinMain(), aadd(), MainWndProc(), wadd(), and wWinMain(). Definition at line 18 of file getargs.c. Referenced by __getmainargs(), __p___argv(), aadd(), and init_logger_addr(). Definition at line 20 of file getargs.c. Referenced by __p___wargv(), __wgetmainargs(), MainWndProc(), wadd(), and wWinMain(). Definition at line 757 of file stdlib.h. Definition at line 733 of file stdlib.h. Definition at line 22 of file environ.c. Definition at line 13 of file txtmode.c. Referenced by _tpopen(), and main(). Definition at line 520 of file stdlib.h. Definition at line 722 of file stdlib.h. Definition at line 771 of file stdlib.h. Definition at line 10 of file environ.c. Definition at line 11 of file environ.c. Definition at line 27 of file environ.c. Definition at line 699 of file stdlib.h. Definition at line 67 of file strerror.c. Referenced by __wcserror_s(), _strerror(), _wcserror_s(), perror(), strerror(), and strerror_s(). Definition at line 79 of file strerror.c. Definition at line 23 of file environ.c. Definition at line 13 of file environ.c. Definition at line 12 of file environ.c. Definition at line 14 of file environ.c. Definition at line 29 of file environ.c.